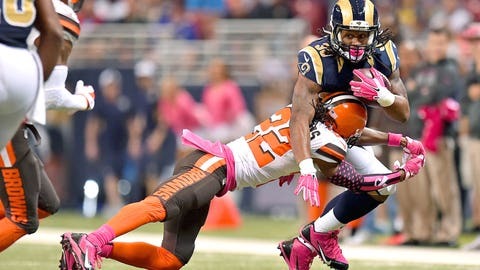 Rams running back Todd Gurley notched his third straight 100-yard game and scored his first two touchdowns Sunday against the Browns. St. Louis Rams rookie running back Todd Gurley went over 100 rushing yards for the third straight game and scored his first two touchdowns during Sunday’s 24-6 win over the Cleveland Browns. Gurley finished with 128 yards on 19 carries, scoring on second-half runs of 1 and 16 yards, to put him over 100 in each of his three career starts after rushing for only nine yards on six carries during his Week 3 NFL debut. Against the Browns, Gurley ripped off a 48-yard run on the Rams’ first possession of the third quarter and reached the 100-yard mark in the opening minute of the fourth quarter, becoming the first Rams rookie running back with three straight 100-yard games since Eric Dickerson (1983). Gurley also added a season-high four receptions for 35 yards. During his stirring three-game run, Gurley has amassed 433 rushing yards on 68 carries for an average of 6.4 yards per pop. Prior to last weekend’s bye, Gurley rumbled for 159 yards in a Week 5 loss at Green Bay to follow up a 146-yard effort at Arizona one week earlier in his first career start. Gurley was held out of the preseason and the first two games while recovering from an ACL tear sustained last November that ended his college career at Georgia.